You Gotta See This goes Universal – Now for the iPad 2! A fun photo app we have been using on our iPhone’s for some time now, You Gotta See This, has gone Universal. Which means, if you bought it for your iPhone, it will now run on your iPad without buying another copy of the app. If you have not see the power of You Gotta See This yet, it is an app that uses the sensors in your iOS device to automatically snap pictures as you move your iPad around. 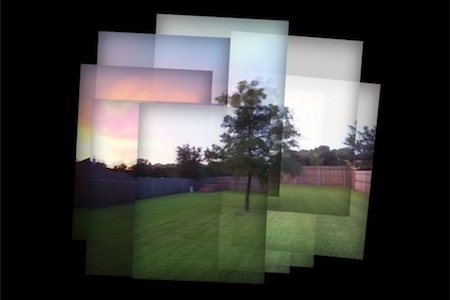 Then, the app stitches the images together like you have a stack of photos on the coffee table. It isn’t perfect for every situation where you want a panoramic style image. But, it is great for getting creative with how you move the camera around. You Gotta See This has seven different image layouts, from overlapping to end-to-end and even images side by side without touching. You can sweep through the options of layouts till you find the one you like. When your good, the app allows the image to be saved to the iPad photo area, or share out via Twitter, Facebook, Flickr or as an email attachment. 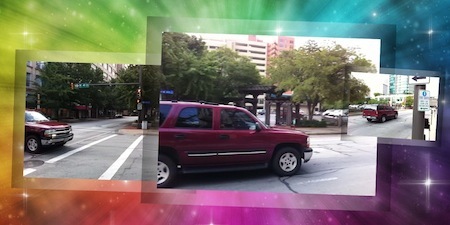 The below two images were taken moving the camera from the right to the left with traffic flowing from the left to the right through the intersection. These are the same ‘photo’ but two different layouts chosen giving a completely different effect. Another layout choice in You Gotta See This, using an image taken moving the camera with the traffic. This one we used in a presentation that we put together on our iPad.